Scallops (queenies) photographed on the sea bed (here off the Isle of Man).Scientists from Bangor University, working together with the Welsh Fishermen’s Association, Welsh Government and Natural Resources Wales have published their findings from the world’s largest ever fishing impact study, funded in part by the European Fishery Fund. 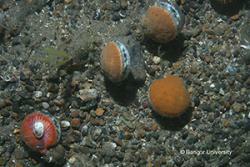 Cardigan Bay Special Area of Conservation (SAC) was closed to scallop fishing in 2009. Research led by Bangor University has focused on understanding the amount of scallop fishing within the SAC that would be considered sustainable and that would not damage the conservation features of the area. To do this, the team spent 18 months preparing to undertake a mammoth fishing experiment in which 12 different sites were fished at different intensities by commercial boats. The results of the fishing were compared to four areas left unfished. Having now established that the area can withstand a certain level of fishing, the next step in the work is to provide more information to further guide the agencies responsible to decide on future management measures, and if appropriate, for setting the level of fishing to be permitted. 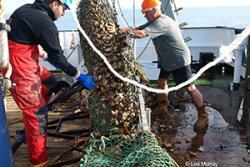 Emptying a scallop dredge on the RV Prince Madog (illustrative- as part of another research project).Most fisheries are managed according the target species, in this case scallops. Setting two thresholds, one for seabed disturbance and one for scallops would provide a strong incentive for fishermen to disturb as little of the seabed as possible. Relevant reports 59, 60 and 61 can be found at here.